In dog health, panting is usually not a sign of illness in a healthy dog. Panting is a normal canine respiratory response to heat, excitement, anxiety or exhaustion after intense physical activity. However, if your dog pants for no obvious reason, the panting may indicate a health problem. Here's what you need to know to recognize the difference between normal panting and abnormal panting. Heat: Panting is the main way a dog cools down when he gets hot. The rapid breathing helps him release excess body heat. Recent physical activity: A dog pants to catch his breath and normalize breathing after a strenuous physical activity like running. Nervousness or excitement: A dog may also pant in response to anxiety or excitement. Panting generally occurs periodically between long episodes of regular breathing. A healthy dog will only pant for a short period of time before his breathing returns to normal. When your dog pants, offer him some water to make sure he is not thirsty. The water will also help him cool down faster if he is hot. While most panting is normal, sometimes excessive or abnormal panting is a symptom of a health condition. A collapsing trachea: A dog with a collapsing trachea has a cough that sounds similar to a honking goose. The cough is generally triggered by physical activity or excitement. Obstruction in the upper respiratory tract: If a dog has an obstruction in his respiratory tract, he may cough or experience noisy breathing. Lung conditions: A dog with a problem such as fluid build up in the lungs will experience labored breathing. The dog may have episodes of labored breathing where he extends his head and neck and takes short, rapid, labored breaths. His lips, gums and tongue may look blue from lack of oxygen. Bronchitis and pneumonia: A dog may wheeze if he has an infection with inflammation of the bronchi such as bronchitis or an inflammation of the lungs like pneumonia. Bronchitis causes a harsh, dry cough that may cause retching. Pneumonia symptoms include labored breathing, fever, lethargy and a congested-sounding cough. Heartworm: An affected dog in an advanced stage of heartworm infestation will experience labored breathing. Other symptoms of heartworm may include a cough, lethargy, anemia, jaundice or a swollen abdomen. Congested heart failure: A dog experiencing congestive heart failure is generally lethargic, tires easily, gets out of breath easily after exercise and may pant excessively. He also has a chronic dry cough triggered by exercise. He may also lose his appetite and be less interested in normal activities. Dilated cardiomyopathy: This heart muscle disease may be associated with hypothyroidism. An affected dog may tire easily after normal exercise, have a chronic cough, be lethargic and refuse to eat. Labored breathing should not be confused with panting. A dog experiencing labored breathing shows signs of distress and has difficulty drawing breath. Call the veterinarian if you believe your dog's panting is abnormal and suspect a health problem. Take your dog to the veterinarian immediately if he appears in distress, wheezes or has difficulty breathing. When it comes to dog health, panting is usually not a reason to call the veterinarian. A healthy dog experiencing normal panting will only pant for short intervals and behave normally. You can also check the color of your dog's tongue. 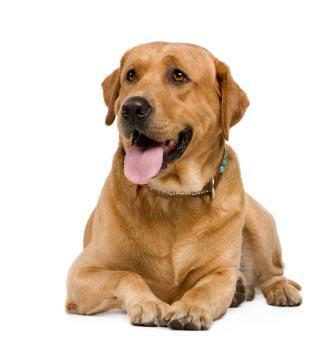 During normal panting, the pink color of the tongue indicates a healthy oxygen level in the blood. Once you recognize the signs of a potential health problem, you can make an informed decision about when to call the veterinarian.